Discussion in 'FIFA 18 Mods, Patches and Total Conversions' started by Aranaktu, Sep 27, 2017. Special thanks to gaelyoh for sharing the game with me. Cheat table for FIFA 18. Designed to improve your experience with Career game mode. To run this tool you need to install Cheat Engine 6.7. What is Cheat Engine? vvido22, Victor., msrajjc2 and 6 others like this. hey mate. thanks for this. could you possibly get the edit potential again? Thank you so much! I have the trial and your fix @fearless... works fine but what does the function "Unlock "Edit Player"" do? If i enable it, should i be able to edit the player? Wahoo thank you so much!!!! Seems to be working great, if you could remove the fog of war so players can be signed/viewed without scouting that'd be great as it for me is the greatest annoyance of career mode! "Edit player" is locked by default if you didn't bought this item in EASFC catalogue, or if you are playing offline. It's not possible to edit player stats atm. Aranaktu, you move fast this year. In fifa 17, the only reason for me to play some was your CE Table which allowed some editing for ini. files. This year seems to be more promising and cheat engine the best hope for ini. editing still ,so please, do not give up. Important ads would be potential editing, body type, position and, I do not know if possible hair code. ah ok. thanks for what you have done far. hope you can get that in there. it really irritates me that EA still havent fixed their create player function to contain potential, composure, skill rating, work rates & traits. so i use your cheat table to fix my players. always appreciated. Aranaktu, you are back at it again, awesome. Now I am even more hyped to start my own career on Friday. Is it hard to create this table or can you update some adresses from the FIFA 17 one? Also, how much "old" features do you think will find it's way into this one? 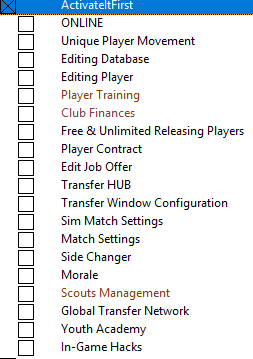 Can I expect the features related to the National and Club ID aswell as the "Playerregen=0"? These were the ones I was using the most. It's not hard (except lampuiho script), but it's time consuming. Probably everyting from old table will be imported to the new one, but dunno how long it will take. Aranaktu, what do you say, this year can we see a playergrowth.ini or career_regenplayerattributes.ini in the dlc folder? If we could edit those it would solve a lot of problems. I didn't checked which .ini files are used by the game. I've only noticed that EA didn't changed anything on how the .ini files are loaded into game memory. Humble apologies I see it now, fantastic thank you! I give a try to career mode and it's pretty much the same as last year and added some worthless and boring cut scenes. So a cheat engine table with at least same features as last year would be very usefull. - Added "Player Data". I'll probably add everything from table called "players" located in fifa database in upcoming days. WARNING!! Make a backup save of your career mode progress before you edit anything in "Player Data". Otherwise you may lose your whole progress. Join discord channel to check news about update and development progress. menten, qasar80, maic and 1 other person like this. Thanks Aranaktu. Works perfectly. Can't wait for you (or someone else) to find the Potential & Skill ratings. - Added "Edit Job Offer". Grimbarian, maic, menten and 1 other person like this.